Happy Labor Day, comrades! I am enjoying a much-needed day off, despite the university being in full session, as classes began only last week. I worked twelve days in a row (plus a Pleasant Valley Sunday), and today I get to celebrate the fruits of that labor. I've been trying to get caught up on items which I copied or collected over the summer: tidbits, hors d'oeuvres, and appetizers, mostly; mentions, blurbs, and anthologies. Two items come from the serial British Book News, a monthly collection of reviews of new books, put out by the British Council between 1941 and 1993 as a purchasing guide for schools and libraries. a map of verona. Henry Reed. Cape, 3s. 6d. lC8. 60 pages. The first book of a distinguished poet and critic. Stylistically, Mr. Reed is considerably influenced by the later manner of T.S. Eliot. In the title poem he muses over a map and its literary and historical associations; in 'Tintagel' he evokes memories of Tristram and Iseult in the ruins of the castle; the more Tennysonian 'Philoctetes' and 'Chrysothemis' take the reader back to the ancient Greek world. There is also an ironical section, 'Lessons of the War'. 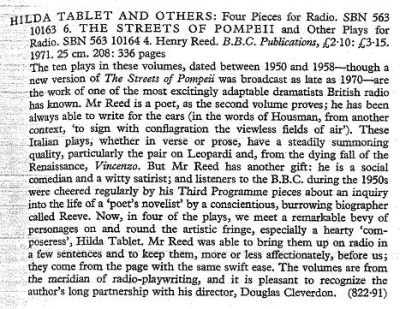 Reed also appears in British Book News for his pamphlet of criticism written for the British Council, The Novel Since 1939 (1946).